costs. How much? Based on calculations from the prestigious University of California Lawrence Berkeley National Laboratory, the savings can be substantial. 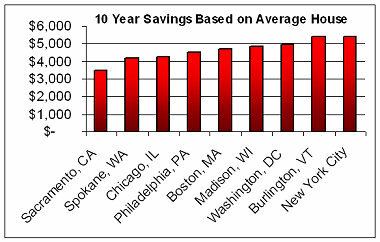 For example $4,956 over the next 10 years for an average home in Washington, DC or $5,852 in Concord, NH. * These numbers are based on a Light Filtering Shade with Energy Saving Sidetrack. Without the side track savings are reduced by 17%. These numbers prove that window coverings are a worthwhile investment and solid solution to improve a home's energy efficiency. Heating costs are projected to increase for all fuel types, according to forecasts by the Energy Information Administration. By using energy efficient products, the average homeowner can cut energy costs by 30 percent. Improving home insulation is one of the fastest and most cost efficient ways to reduce energy waste. A good insulating system protects a home from outside temperatures and protects it against air leaks. Windows are one of the greatest sources of wasted energy in the home. The smallest gap or leak can equal as much airflow as an open window. In the winter, warm air from inside the home is trying to escape through windows. In summer, the sun conducts heat through your windows, contributing as much as 53% heat in the home. The installation of energy efficient window treatments are one of the best ways to conserve energy and reduce utility bills. Homeowners can save from 10% to 25% of their energy bill by improving the insulation of their windows with energy efficient window treatments. To be effective, window treatments must trap air between the shade or blind and the window glass. EcoSmart Insulating Cellular Shades act as a barrier to heat flow, trapping air between the shade and window and helping you to save money on energy costs. Adding the Energy Saving Side Track System can provide an additional barrier to seal the edges of drafty areas around windows.